What are you doing this weekend? The weather is nicer so it would be a good weekend to attend a Cash Mob! What is a cash Mob? Cash mobs use social media sites to draw customers to a local business. On average, mobbers spend $20 in cash, (or what they can afford) and then meet up at a local food or beverage establishment as a post-mob activity to celebrate! As a community we can all help local businesses grow, make people happy, and get quality local goods for ourselves and our families. The local movement is happening on www.kitsapcountycashmobs.com and is being organized via business owners who are administrating facebook pages in each town. 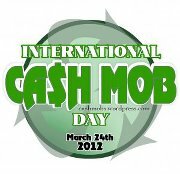 March 24th is National Cash Mob Day and two really great Cash Mobs are happening in Poulsbo and Bremerton! The Cash Mob in Bremerton is at CJ’s at 1417 Park Ave across the street from Evergreen Park at Noon. Come spend a twenty and check out CJ’s store. Afterwards they are going to meet at Rachel’s on the Eastside to socialize. Bring a friend and make some new ones. Kitsap County Cash Mobs and local town administrators are hopeful to be able to cash mob one locally owned business per week-per town! This is a very good start!